As the legal marketplace changes dramatically in response to global financial trends, it is more important than ever for lawyers to hone their practical business skills in addition to their legal acumen. Penn Law has partnered with the Wharton School to provide future lawyers with the key management and business skills they need to counsel clients toward success in today’s competitive marketplace. Penn Law and Wharton launch first-of-its-kind management program for law students. The Wharton Certificate in Management is designed to increase the business skills and leadership capabilities of upper level law students who aspire to lead key parts of a business, non-profit, agency, or firm and form the pool of future top leadership of any organization. University of Pennsylvania Law School students may earn a Wharton Certificate in Management upon completion of a custom-designed, one-semester course open to all 2L and 3L students. 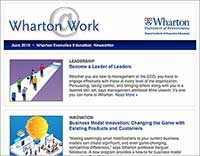 The Wharton Certificate in Management is designed by Wharton’s Aresty Institute of Executive Education in conjunction with the University of Pennsylvania Law School. “By making this course part of the curriculum, we are underscoring the importance of acquiring business knowledge, both to understand and interpret the concerns of business clients and to equip students with a set of transferable skills they can apply in diverse professional settings over the course of their careers,” says Heather Frattone, Associate Dean for Career Planning & Professionalism, University of Pennsylvania Law School. For more information please contact the Penn Law registrar’s office at all-reg@law.upenn.edu or +1.215.898.6427. Advance your strategic decision making capabilities to think faster and more creatively about current competitive strategies and solutions. Deepen your understanding of organizational dynamics to improve the design and implementation of new initiatives and avoid negative or non-productive conflicts. Build capabilities for leading teams across functions. Develop knowledge in the core areas of marketing, management, strategy and finance. Understand how financial data is generated and reported, as well as how it is used for decision making, analysis, and valuation. The focus will be on developing content knowledge in these areas and how to connect this knowledge to other disciplines based on current research and best practice. 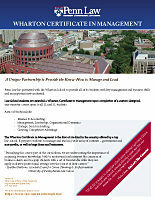 The Wharton Certificate in Management course counts as three Penn Law credits. As a Penn Law student, you are permitted to take four classes outside the law school. Because of the breadth of material covered, this class counts as two classes outside the law school. For more information about how the Wharton Certificate in Management fits into your course of study at Penn Law, please contact the Penn Law registrar’s office at all-reg@law.upenn.edu or +1.215.898.6427. The Wharton Certificate in Management will be awarded upon successful completion of LAW 550001 — Wharton Ex Ed: Management. This three-hour semester course meets twice a week for ninety-minute class sessions during the regular Penn Law semester. The course is divided into four modules: Finance and Accounting, Leadership and Organization Design, Strategic Decision Making and Leadership, and Competitive Advantage. Like many upper-level courses at Penn Law, the curriculum reflects how the law now intersects with a broad array of disciplines. Topics in the Finance and Accounting module include accounting terminology and process, financial decision-making, and analysis of financial reports and key performance indicators. The Leadership and Organization module includes such topics as communication styles, leading with emotional intelligence, organizational influence and persuasion, leading teams, and understanding team dynamics. Strategic Decision-Making topics include critical thinking for real-world, real-time decisions, planning in times of uncertainty, decision making and leadership, and discovery driven planning. The Competitive Advantage module focuses on building personal brands. 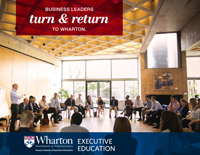 The Wharton Certificate in Management program is open only to Penn Law students. As a Penn Law student, you may enroll in LAW 550001 Wharton Ex Ed: Management just as you enroll in your other courses. Should you encounter any registration issues, contact the Registrar at all-reg@law.upenn.edu. For more information about how the Wharton Certificate in Management fits into your course of study at Penn Law please contact the Penn Law’s registrar’s office at all-reg@law.upenn.edu or +1.215.898.6427.